You’re engaged — congratulations! Near the top of your to-do list: choosing a creative save-the-date to give your guests a thoughtful heads-up. Your options are plentiful, ranging from the very formal to the truly original and quirky. Take some time to choose a style that reflects your personality or gives a glimpse of your theme and décor. You’ll be inspired by these fun and innovative ideas. Carving your names into a tree imparts a bit of nostalgic romance — but these days, you don't need to actually cut into a tree. Digitally-carved names and date ensure that no trees are harmed! Capture the unique personalities of the bride and groom with amusing customized caricatures. A personalized boarding pass will set the stage for a fun-in-the-sun destination wedding. For some retro fun, add your engagement photos to a custom photo reel and viewer. Send a sweet reminder of your wedding date with these beautifully decorated homemade cookies that can be matched to your color scheme. Your guests will love this cute and incredibly unique design. Celebrate your growing love with this cute pun. Handmade seed paper is embedded with pretty garden flower seeds, ready for planting. Share your wedding adventure with a superhero save the date. The future is yours. 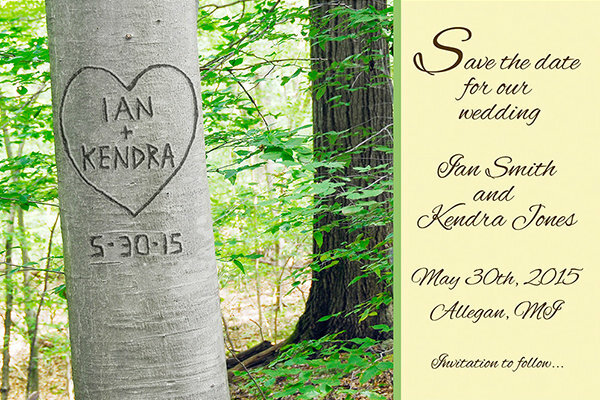 DIY your save-the-date with this innovative (and free!) ouija board printable. Make a beautiful first impression with elegant handkerchief designs, available as save-the-dates and invitations. Deliver your message by air with a printable vintage airmail airplane. Lovely vintage scenic destination postcards provide a charming view of your wedding location, customized to your city, state, or venue. Guarantee that your friends and loved ones will pencil you in with this clever DIY printable. Who wouldn’t love finding one of these DIY balloon save-the-dates in their mailbox? Your wedding date and location is revealed after being inflated. Get the instructions here! Send your friends and family a save-the-date that they’ll put to good use. Send out a fanciful message in a bottle — a great choice for your beach or destination wedding. Looking for a totally unique idea? Break the news with this ingenious “break it open” egg, handmade to order by Break the News. Map your destination wedding with a beautiful hand-painted watercolor design. Just the ticket for your big event, these magnetic tickets can be adapted to a sports, concert, or Broadway theme. Book-loving couples can share their love story with this novel library card save-the-date. Choose a sweet and whimsical design with imported laser-cut stationery. These completely personalized crossword puzzles challenge your guests: just how much do they know about the future bride and groom? Capture the drama of your love with a movie poster theme. With a little creativity, you can recreate your favorite iconic movie scene. Animal lovers can include their favorite pet in the big event. Getting your cat in that tux? Totally up to you. A pop-up design is a unique take on the traditional paper stationery. Let your guests know that you’re lucky in love with a scratch-off ticket save-the-date. You complete each other! Announce your date with handmade wooden puzzle piece magnets.